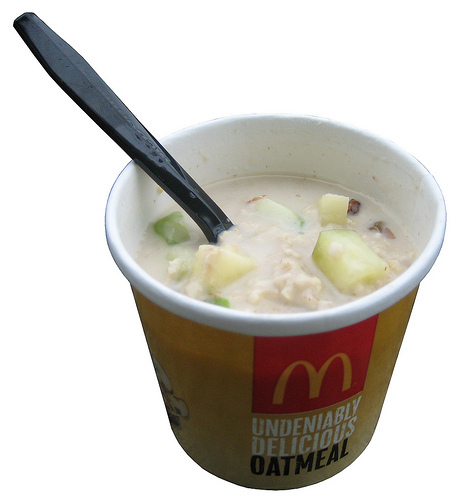 When the fast food chain McDonald’s decided to add oatmeal to its menu in January 2011, it literally sugar-coated the offering as a “portable, affordable and balanced breakfast solution… to help make it easier and more inviting for our guests to eat more whole grains and fruits”. Although a single serving of plain oatmeal has one gram of sugar, one serving (253 grams) of McDonald’s fruit and maple oatmeal with brown sugar contains 32 grams of sugar. One serving of the same oatmeal, without brown sugar, contains 18 grams of sugar, according to the company’s nutrition. “Why would McDonald’s… take a venerable ingredient like oatmeal and turn it into expensive junk food?” lamented New York Times columnist Mark Bittman in February 2011. McDonald’s oatmeal, he pointed out, “contains more sugar than a Snickers bar and (is) only 10 fewer calories than a McDonald’s cheeseburger or Egg McMuffin”. So you are better off serving your child a candy bar for breakfast than fast food oatmeal? I don’t feel so bad for letting my son eat a cookie Christmas morning. Nation of Change continues to explain that even though processed food is cheaper, the cost to our health and environment is grave. It’s similar to cheap Chinese products sold at Wal*Mart. People feel like they are getting a good deal, but the hidden costs are astronomical. Families living in lower socio-economic status are the targets of such marketing. If whole foods were more prevalent in their neighborhoods than fast food chains, perhaps these families would actually take a few minutes to make oatmeal rather than buy it at McDonald’s. Oatmeal is actually fast food when cooked at home. Fast food is about convenience and cost, but obesity and long term health problems are neither convenient nor inexpensive. It is time we started looking at the whole picture rather than the short term and expose marketing tactics for the lies that they are. If whole foods were more prevalent in their neighborhoods than fast food chains, perhaps these families would actually take a few minutes to make oatmeal rather than buy it at McDonald’s. This is the sort of patronizing nonsense that leads to less personal responsibility, and more of the Nanny State. Oatmeal doesn’t need to be “more prevalent,” it just needs to exist. Anybody who can’t find something as basic as oatmeal to buy needs to look a little harder, walk a little farther, request it of their shopkeeper a little louder, or move. I agree my statement was a little blanketing. I was thinking of the predominance of liquor and convenience stores in urban, poor areas. In the suburb I grew up in, there was a McDonald’s right near a supermarket.